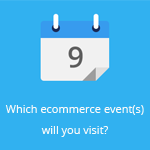 November 27, 2014 by Ecommerce News. About Statistics with tags France, Germany, Russia, Sweden, The United Kingdom. 3814 views. While Cyber Monday is still more popular in the United States, in Europe retailers increasingly embrace this day to boost their sales. 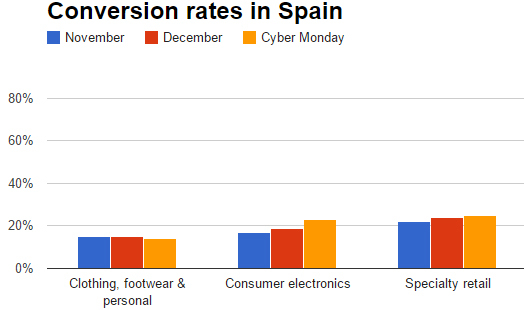 In the UK and Germany there was an increase in conversion in consumer electronics during Cyber Monday last year, while there was a decrease for clothing and footwear in the UK and Spain. For those who don’t know, Cyber Monday is the name marketers gave to the Monday after Thanksgiving in the US. It was created to persuade people to shop online. In the offline retail world, there was already Black Friday (the Friday following Thanksgiving Day), so it was no surprise an online equivalent made an entrance. As the Google Trends chart shows, the interest in Cyber Monday has increased during the last couple of years, but was this also accompanied by greater propensity to buy than on other days? 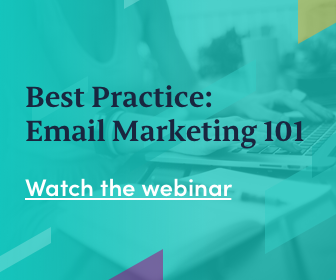 For this ecommerce conversion company Ve looked at their cart abandonment data. 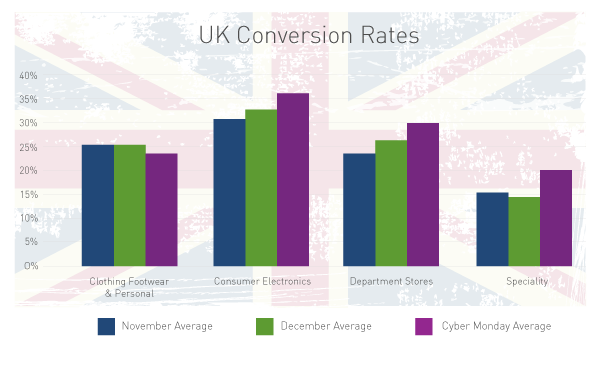 Ve shared some interesting conversation rates for the US and the UK with us and even presented us some more conversation data from other European countries. When compared to the average conversion rate in November and December, there’s an uplift in consumer electronics notable on Cyber Monday in the UK. 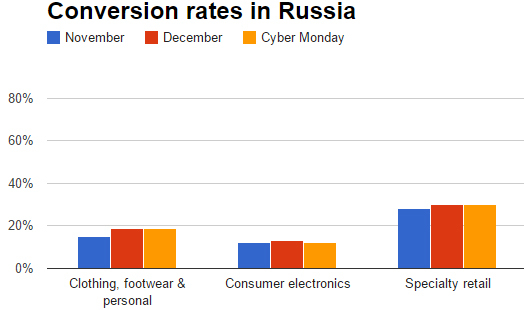 Clothing and footwear, however, saw a decline in conversion rates during this special online shopping day. 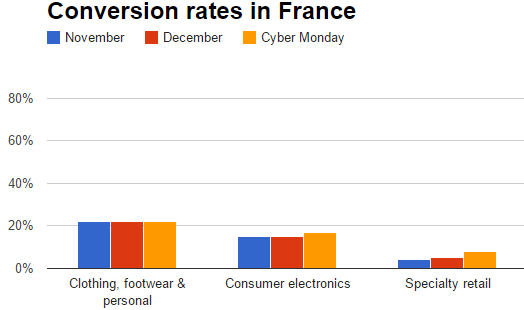 Ve also studied the conversion rates during Cyber Monday last year in other European countries. 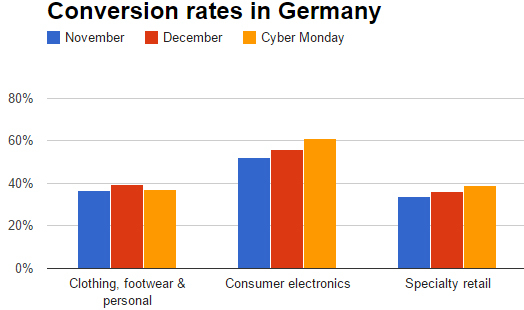 The data shows there’s also an increase in consumer electronics in Germany during this online shopping day, while the conversion rate in clothing & footwear went down. 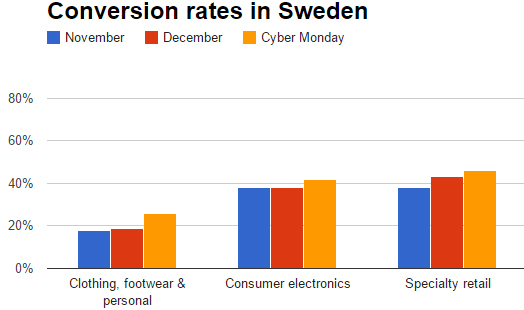 This product category seems to be especially popular in Sweden, where the November average is 18%, but the Cyber Monday average reaches 26%. More about France, Germany, Russia, Sweden or The United Kingdom.